Alone in the attic of an Apothecary’s Shop, an unwanted little boy wrote down his notes in a tiny notebook. He watched things like the progression of the sun across the floor. From that he designed sun dials to tell the time, sun dials the grown-ups could use. This excellently researched biography leans on primary resources and a keen understanding of a young person left on his own in the world. 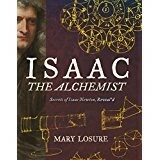 The story of Isaac as a boy, and then a man, who follows his own interests intensely, leads us through the worlds of science, physics and the smoky world of alchemy. During Isaac’s time in history, science and mystery were still so intertwined people weren’t sure exactly which was which. The concoctions men put to steaming and smoking over open fires often made poisonous smoke instead of gold, but still they persisted. Teachers, librarians and parents all will be impressed with the quality of writing as well as the depth of research. Use this as an example of source notes, and photo credits. Students will be enthralled to see actual pages from Isaac’s tiny notebook. This is a must have book for all elementary, middle school, and public library biography sections. Beyond that, it is simply a spell-binding read showing what one person can accomplish on his own through persistence. Unfortunately, his middle school basketball team needs a good all-around player, not just a shooter to win games. Richie was slow to pick up on the necessity of a complete skill set, but once he figured it out, the whole team won. 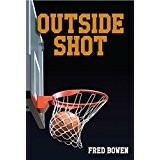 This realistic new addition to Fred Bowen’s Sports Series is well-written and accessible to readers across many age levels. Players and fans alike will enjoy their trip through the season cheering for Richie. Parents, teachers and librarians can use the non-fiction section in the back as a comparison with the fictional front section in teaching reading skills. Math skills are strengthened by the score keeping techniques and percentages of baskets referred to in this story as well as in real basketball. Students may decide to keep their own stats after reading this book.